On 12th July 2013, this blog passed 30,000 views. Thank you for contributing!! Although, actually, it’ll be a bit more since it’s not always been on my current host (WordPress). Where are people viewing from ? 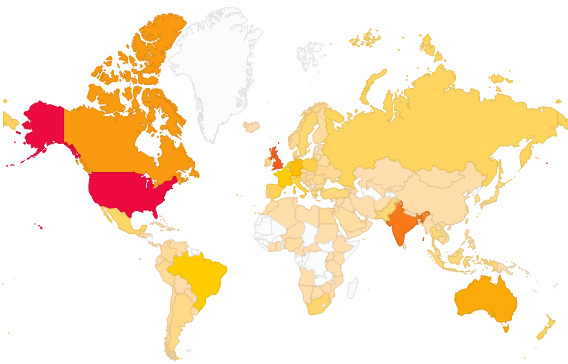 Mostly from the US, closely followed by the UK, then India, so actually no surprises there. What are the top 5 posts ? How do viewers get here ? The busiest month was October 2012, when I had over 2,000 views. That was directly due to me hosting TSQL2sday. I’m averaging 1,500 views a month and have been for the past year, with over 1,000 distinct visitors a month since WordPress started tracking them in December. Thank you for visiting, and I hope you continue to find this blog helpful.